We are suckers for roadside kitsch. We LOVE them. 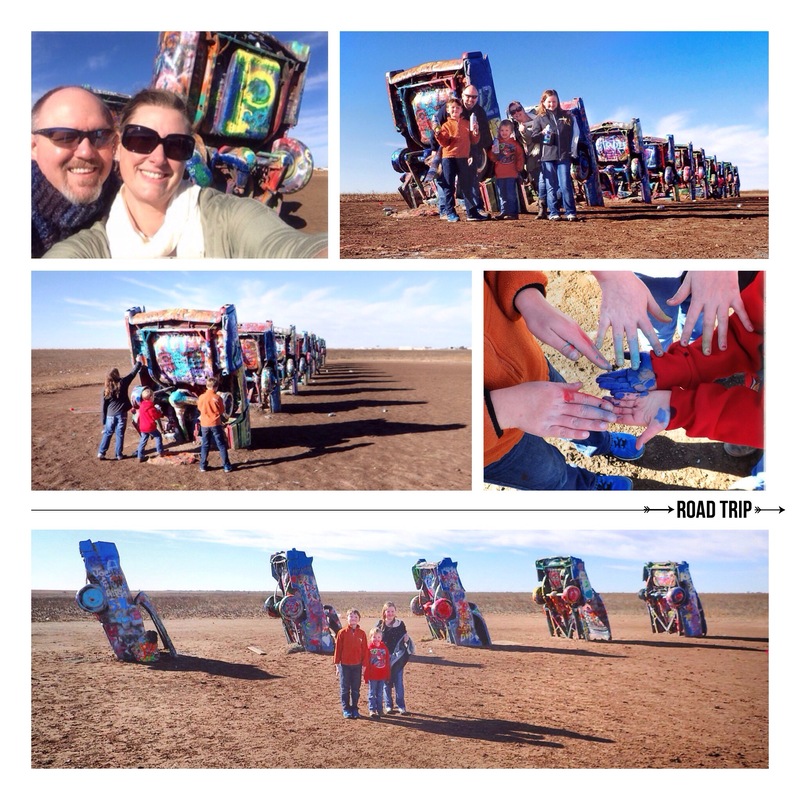 So, of course, the Cadillac Ranch was tops on our list of MUST SEE attractions. 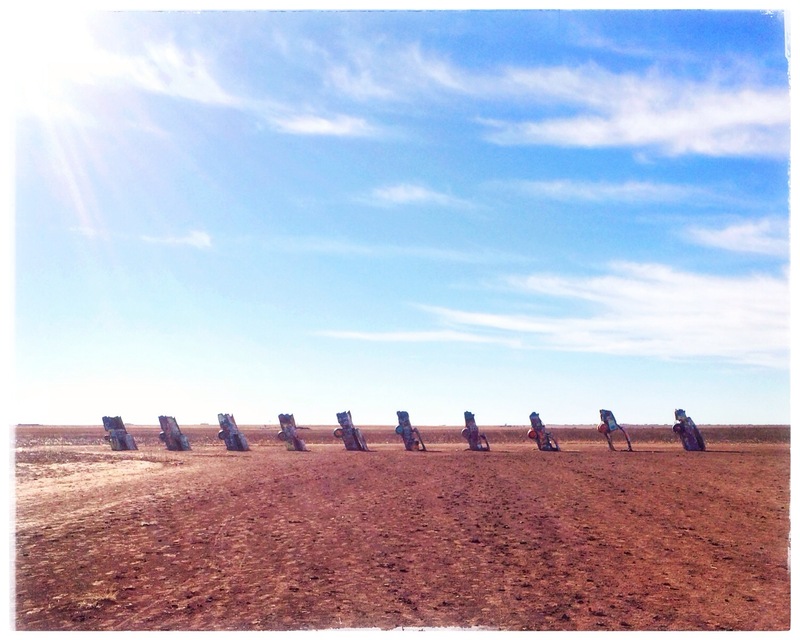 As a Native Texan, I thought everyone had heard of the Cadillac Ranch. It’s legendary. But, it has come to my attention recently that there are people who have never heard of it. I even talked to a non-Texan who has driven past it multiple times and never knew what it was. When I told him we were going, he had NO CLUE what I was talking about. He said it sounded like a brothel. OMG… NO! 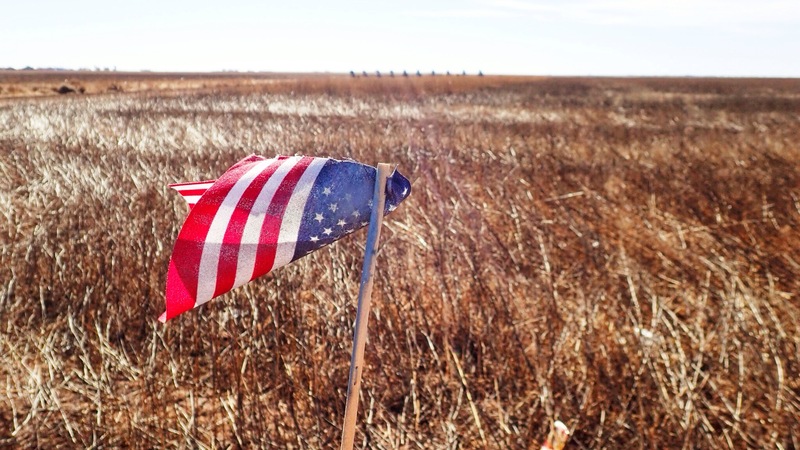 For all y’all who’ve never heard of the Cadillac Ranch, here’s your history lesson: Stanley Marsh 3 was an eccentric Texas millionaire who believed that rich people had a responsibility to behave unusually and interestingly. He was a legend in his own time for his pranks. He believed in art for the sake of art, and he had a hilarious sense of humor. I read in TX Monthly that once, he threw a party for some Japanese businessmen where he only invited men who were over 6’4″ to reinforce the stereotype that all Texans are tall– HILARIOUS! His eccentric sense of humor has been displayed throughout Amarillo over the years through various installation art pieces and public pranks. Oh, Stanley Marsh 3…. If I was a bazillionaire, I think I’d use your pranksterism as inspiration! The most famous of Marsh’s art pieces is the “Hood Ornament of Route 66,” the amazing homage to the golden age of American automobiles and Route 66 and roadside kitsch and just plain AWESOME– The Cadillac Ranch. In 1973, Marsh invited a San Francisco artists collective called the Ant Farm to his Amarillo ranch. The group bought 10 used Cadillacs (model years 1948-1963) from salvage yards, averaging $200 each. The cars were partially buried, nose down, in a line facing west, along Old Route 66. At first, all the Caddies were their original, factory colors, but over time, visitors and tourists started scratching their names in the paint and spray-painting the cars. And then the vandals and souvenir hunters stole everything they could pry off the vehicles (windows, doors, radios, etc.) until Marsh had to have the axels welded to the frames to prevent future theft. The great thing is, Marsh LOVED the fact that everyone visited and spray painted the Ranch. He encouraged it, and always said he thought it looked better every year. In 1997, the entire shebang, including the trash, was dug up and moved 2 miles west to escape urban encroachment. There are always people visiting and painting. I bet that if you visited every day for a whole year, you’d see a different picture every day. OK, enough on the Cadillac Ranch itself. Y’all want to hear about OUR trip, right? We arrived at about 10:30 on a Monday morning. Clear skies, cold breeze, practically empty. And yep. We are THOSE PARENTS. We are the parents who stopped at Home Depot on our way there and bought $20 worth of spray paint and then turned the kids loose to explore the aerosol arts. It was fantastic. Three kids, six cans of spray paint, ten Cadillacs, and, for the most part, we had the place to ourselves. They made art, they ruined their clothes, they got covered in paint that was next to impossible to get off, but they also made memories that will last way, WAY longer than any of those other things.